With their papery petals and bold color schemes, poppies are a happy, carefree member of the flowerbed. The fact they tend to seed themselves makes them even more appealing and makes light work of flower gardening. Many flowers use the name poppy without being 'true' poppies. True poppies are in the Papaver genus while plants like California poppy are in the Eschscholtzia genus. 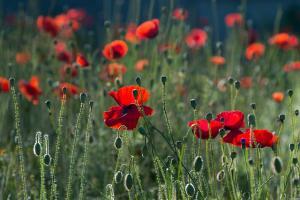 Among the true poppies, several are commonly grown by gardeners, including both annual and perennial species. All have attractive ferny foliage and characteristic papery petals as well as decorative round seed heads useful in dried arrangements. Annual poppies have a tall upright growth habit, making them useful at the back of annual flower beds where the blossoms can emerge above smaller plants in the foreground. They are also used in wildflower gardens because of their ability to re-seed themselves. 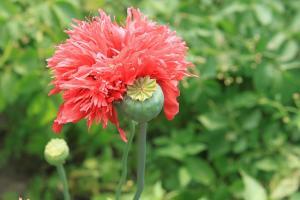 Annual poppies can be grown in all USDA gardening zones. They are rarely seen as potted plants as they are commonly grown by seed so check your local nursery or you favorite seed catalog to see which varieties they carry. Field poppy (Papaver rhoeas), also known as corn poppy, common poppy, or Flanders poppy, grows two to three feet tall and bears two- to three-inch wide carmine red flowers with dark centers. This is the poppy associated with Remembrance Day when it is traditionally worn on the lapel in honor of fallen soldiers. Opium poppy (Papaver somniferum) is the original source of all opiate drugs as well as the poppy seeds used in confections. The flowers are nearly identical to field poppies, but the plants are taller and thinner in stature without the lush foliage at the base that characterizes field poppies. 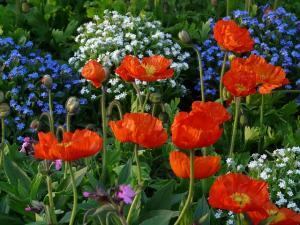 Perennial poppies are useful in perennial flower beds, cottage garden settings and in potted arrangements. The following are commonly available with the bedding plants in most nurseries. Both varieties listed below are hardy in USDA zones 3-9. 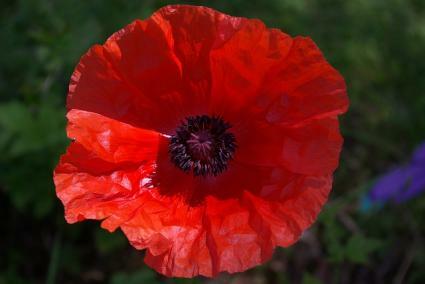 Oriental poppy (Papaver orientale) grows three to four feet tall with fiery orange blossoms up to six inches across. The flowers rise on thin stalks above a mass of lacy foliage that is highly ornamental on its own. Icelandic poppy (Papaver nudicaule) grows one to two feet tall and has two- to three-inch blossoms held high above a tidy clump of basal leaves. Flower color ranges from warm reds and yellows to pastel tones, like salmon and cream. The various poppy species all have similar growing requirements. They need full sun, but have very modest nutrient and moisture requirements. All will grow happily in a rich, well-watered flower bed, though they will also grow and flower abundantly in poor, somewhat dry soil. Perennial poppies are often available in garden centers, but growing them from seed is quite popular because the roots are easily damaged in transplanting. Seed for perennials can be sown in fall or spring. 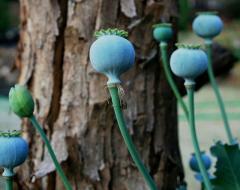 Seed is the only way that annual poppies are grown. Sow seed for the annuals directly on the surface of soil in fall - they will sprout quickly and bloom the following spring. Poppies are cool weather specialists - they start growing early in spring and are generally in full flower by the end of spring. When the heat of summer hits, the plants start to fade and will dry up completely unless they are irrigated. This is a natural form of summer dormancy, however, and when the weather turns cool again the perennial varieties will perk up and put out new leaves. In mild winter areas the perennial poppies are evergreen though they benefit from being cut back about 50 percent in late fall to help maintain a compact form. 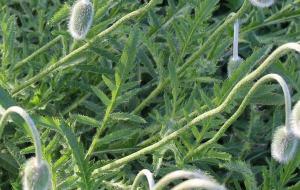 All poppies are prone to seeding themselves, especially the annual species. This trait is ideal in cottage gardens or wildflower plantings, but can make the plants seem weedy in a more formal garden bed. Let them go to seed if you want them to spread themselves - i.e. don't cut the flower stalks down until the seed head has dried and dispersed its seeds. If you don't want them to spread, remove the spent flower stalks before they go to seed. 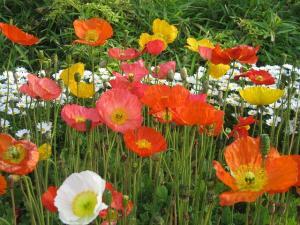 Poppies are virtually never troubled by pests or disease. Poppies are one of the easiest plants to grow from seed - you can even take the dried seed heads and sprinkle out the seed like a saltshaker wherever you want more to grow. The bold saturated colors will make your flower beds come alive.